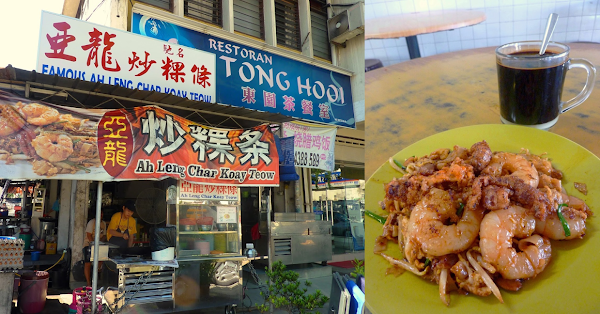 Previously operating at Khoon Hiang Cafe (群香茶室), Ah Leng Char Koay Teow (亚龙炒粿条) has moved across the street to Restoran Tong Hooi (东园茶餐室), right next to Federal Place. As the patriarch's age is catching up to him, the stall is currently manned by his daughter. Regardless, her father is still present to supervise. Unlike many famous stalls, this humble family is rather soft-spoken and does not flaunt their fame like some of their equals do. The plate of Special Char Koay Teow (RM11.50) comes with 4 large shrimps which are reasonably fresh. Meanwhile, the mantis shrimps (虾蛄) are overcooked, therefore are not as delectable as regular shrimps. Blood cockles (血蚶) are few and far between, and are not as juicy as I had hoped for. Most notably, Ah Leng Char Koay Teow does not use Chinese sausage (腊肠). The plate of Special Char Koay Teow has superb "fiery aroma" (镬气). This is attributed to good control of fire under the wok. One key aspect is the use of pork lard (猪油渣) to provide a sense of greasiness. Overall, I am impressed with how the noodle turns out, but the quality of seafood ingredients leaves much room to be desired. Ah Leng Char Koay Teow also operates another stall at Air Itam at night. From what I have heard, the father personally cooks at this nighttime location. Perhaps this is where I should go next.